This is a quality low cost fingertip pulse oximeter that can be used in a Doomsday survival scenario to assist in assessing the health for an injured or sick person. Without an available health care professional, in a survival situation, a pulse oximeter would be invaluable to determine using subsequent measurements whether a person’s condition is getting better or worse no matter what you are treating them for. It will also help you gauge if your treatments are actually working, or if you should save your medicine for use elsewhere. Once very expensive, pulse oximeters tell you the person's heart rate and measure the amount of oxygen in the blood. The CMS 50-DL Pulse Oximeter is a #1 best seller on Amazon and for good reason as it is an outstanding value. See the selected Amazon feedback excerpts below from four health care professionals. 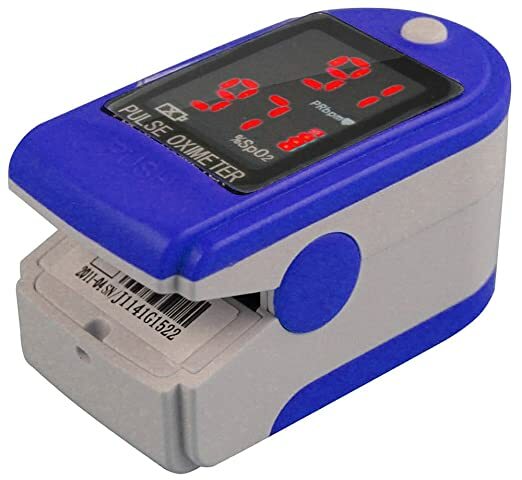 This pulse oximeter is small & lightweight, has a digital LED display and can working continuously for 40 hours. It automatically powers off and has a low battery indicator. This pulse oximeter accommodates a wide range of finger sizes from pediatric to adult and is easy to use. "I am an intensive care nurse and have worked with many types of pulse ox devices. This one is a great product. The digital read out even shows the pleth to let you know how accurate a reading you are getting. I purchased this to help monitor my children at home whom both have had breathing problems. It is easy to use. Comes with everything you need to get started too!!" "I am a Respiratory Therapist, so this product is part of my job. So far it has it has performed better than previous more expensive moniters I have purchased." "..... I'm an ophthalmologist and performed 34 cataract surgeries today. I asked my preop staff as well as the nurse anesthetists to directly compare this new unit to our preexisting, expensive medical quality units on patients all during the day. Whether at the high range (97-100% saturation), mid range, or lower range (as low as 83% saturation) there was excellent correlation between the units. And the CMS 50DL actually responded FASTER to rapidly changing conditions than our expensive models. We were all shaking our heads in amazement by the end of the day. I bought it so that my son and I can fly our small plane over the Rocky Mountains this summer on oxygen and make sure we're not hypoxic. This lightweight, accurate fingertip unit will be perfect for our needs.......Second update: 9-5-14 After two summers of flying across the Rockies the unit is still in perfect working order. I can't say I use it very often, but when I do it's still 100% dependable and reliable." "As a nurse in a long term facility I frequently need quick assessments of patient vital stats. I found this pulse ox to be accurate and easy to use"
The following YouTube video reviews the CMS 50-DL Pulse Oximeter plus the other Contec Pulse Oximeter models that are provided below the video. Through corresponding directly with Dr. Ryan Chamberlin, he recommends this particular pulse oximeter for Doomsday Preppers as it is a great value. See the Blog (linked below) from ThePrepperPages.com for more details from Dr. Ryan Chamberlin concerning what a prepper needs to know about using pulse oximeters as a medical device to assess patients. Also, see the YouTube video above for how to properly use the CMS-50DL model. Dr. Chamberlin is the author of the medical survival book Surviving the Zombie Apocalypse: First Aid Kit Building and Mini Med School for Preppers.